Thinking of a biological network as an electrical circuit is a useful analogy. Electrical circuits take input voltages and convert them to appropriate output voltages so that a desired outcome is achieved. In much the same way, biological networks take particular input stimuli and convert them into appropriate biological outputs such as metabolic changes or transcriptional remodeling. Electrical engineers uncover the inner workings of electrical circuits by measuring the transfer function between input voltage and output voltage. In much the same way, we develop microfluidic and optogenetic technology to generate dynamic inputs to interrogate biological networks and measure their output. By combining these perturbative experimental approaches with pathway models, we can uncover the underlying connections and kinetics in biological signaling and regulatory networks. 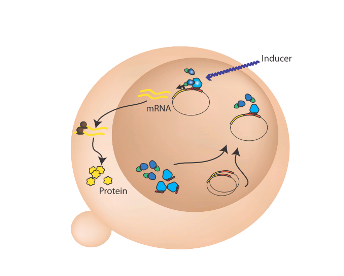 Single mRNA molecules visualized in yeast responding to a combination of MAP kinase pathway stimuli. The mitogen-activated pathways in S. cerevisiae are kinase cascades that allow yeast to respond to a variety of stimuli including mating pheromone, osmotic stress, and nutrient conditions. Though each pathway responds specifically to its cognate stimuli, there are many shared protein components and potential interactions between pathways, thus making this an ideal system in which to study mechanisms of signaling specificity.For example, the pathways responsible for responding to mating pheromone and hyperosmotic shock are able to respond specifically to their designated input despite sharing identical and homologous proteins. We previously demonstrated that signaling specificity between these two pathways is maintained by downstream mutual inhibition [McClean, et al (2007)]. Recently, we have used single mRNA fluorescence in situ hybridization [McIsaac, et al (2013)] to measure pathway cross-activation and found that it varies greatly between different S. cerevisiae strains. Interestingly, the amount of crosstalk seems to be dependent on kinetics and not on protein-protein regulatory interactions. In one strain, rapid mutual inhibition damps crosstalk while in the other spurious crosstalk is allowed due to slow signaling. We are using microfluidics to interrogate the dynamics of these crosstalk interactions. The information capacity of a pathway, i.e., how much information can be transmitted through the pathway per unit time, is proportional to the bandwidth of the pathway. 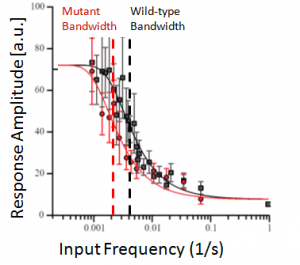 The larger the bandwidth of a signaling pathway, the shorter its response time and the more accurately it can follow a rapidly varying signal. In biological signaling pathways, bandwidth is set by the in vivo kinetics of reactions between signaling components. We previously described an experimental technique combined with a microfluidic device to measure the signaling pathway bandwidth of the hyperosmotic glycerol (HOG) pathway in S. cerevisiae [Hersen, et al (2008)] by following the localization of the Hog1 kinase to the nucleus. Recently we have developed a method for measuring pathway bandwidth from transcriptional reporters and used this method to characterize the bandwidth of the aromatic amino acid catabolism pathway in budding yeast [Dexter, et al (2013)]. Chemical and optogenetic induction systems allow us to perturb a specific protein’s concentration in biological networks. We have developed two methods for perturbing protein concentration in biological networks. Using a hormone-inducible artificial transcription factor [McIsaac, et al 2011] we can rapidly and nearly-gratuitously overexpress a specific protein in Saccharomyces cerevisiae. Additionally, we have developed an optogenetic method for dialing the concentration of a specific protein in steady-state cultures of yeast using real-time feedback control [Melendez, et al 2013]. We will use these technologies to create well-defined perturbations, such as oscillations, in protein concentration and protein activity. By measuring the relationship between our perturbation signal and outputs such as transcription we will be able to put kinetic and directional arrows on pathway regulatory diagrams. In addition, by holding proteins such as transcription factors at a steady-state concentration we can ask what the transfer function is between transcription factor concentration and transcriptional output. 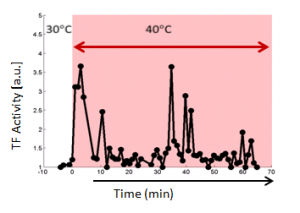 Dynamics of transcription factor activity and localization in response to a stress signal, in this case temperature. It was recently discovered that yeast cells use repeated localization and activation of the Crz1 transcription factor to drive repeated bursts of transcription in response to calcium. We asked how general this regulatory strategy is by performing a microscopy screen to identify transcription factors that also exhibit nuclear bursting under different environmental conditions. Two of the transcription factors (TFs) identified were the yeast stress-response TFs Msn2 and Msn4. In collaboration with the Broach Lab we dissected the upstream signaling proteins and conditions which lead to Msn2/Msn4 bursting behavior [Petrekno et al 2013]. We have continued to work to understand the role of Msn2/Msn4 localization dynamics in allowing yeast to respond to temperature stress using a microfluidic device capable of controlled temperature changes. We find that Msn2/4 dynamics differ in their response to rapidversus gradual temperature changes and that this allows yeast to appropriately adjust their transcriptional response. Feedback control allows protein concentration to be modulated in real-time. Metabolic engineering and synthetic biology focus on constructing biological acircuits that display desirable functions using natural and engineered genetic elements. These circuits are being used to reprogram cells for both biomedical and industrial uses. One of the most laborious and time-consuming steps in synthetic circuit design is determining the appropriate expression levels of the various proteins used to make up the circuit. And often, once this has been tuned for a given organism or strain, it will not work when transferred to another organism. The ability to control protein concentrations exogenously using light and feedback control, such as we have developed, would allow for rapid circuit optimization as well as flexible adjustment if the circuit is transferred to another organism. In addition, the ability to perturb specific protein concentrations in very specific ways and study the response of the synthetic circuit allows for better model creation. We propose to use the real-time light-inducible feedback control of protein levels to optimize existing biological circuits using control theory and real-time learning algorithms. To achieve this goal we will continue to improve and expand our technology for interrogating and manipulating signaling and regulatory pathways. For instance, we have developed an optogenetic system that uses engineered zinc-finger DNA-binding domains to make transcription from an engineered promoter light-inducible without additional off-target effects in Saccharomyces cerevisiae.